When Dr. Robert Boswell ’73 was a student at Marietta College he heard about Founders Day, but didn’t know much about it. Now, the Vice Chancellor for Diversity, Equity and Community Engagement at the University of Colorado-Boulder, is excited to return and be the keynote speaker at the 182nd Founders Day on Thursday, Feb. 16. Boswell had enjoyed a distinguished career at Colorado-Boulder as a faculty member and researcher. He became an assistant professor in Molecular, Cellular and Developmental Biology department and was tenured in 1993. 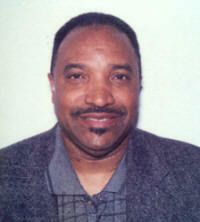 He was also a teaching and graduate assistant while completing his doctorate at Colorado-Boulder from 1975-81. Dr. Richard Danford, Marietta College’s Vice President for Student Life and Diversity, recommended Boswell as this year’s keynote speaker. Boswell, who came to Marietta from Great Barrington, Massachusetts, has served in his current role since 2012. He said he is looking forward to returning to Marietta again. Boswell became the principal investigator of the National Institutes of Health Initiative for Maximizing Student Development (IMSD) in 2003. The IMSD program encourages educational institutions with fully developed research programs to initiate or expand innovative programs to improve the academic and research capabilities of underrepresented students. 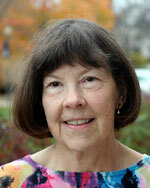 Founders Day is also an opportunity to announce a number of faculty awards, including McCoy Professor and top advisor. Marietta College was officially chartered on Feb. 14, 1835. The College celebrates Founders Day on Feb. 14 or the Thursday immediately afterward. 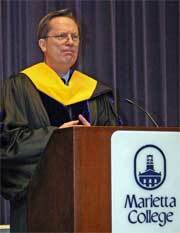 In the four and a half decades since he graduated from Marietta College, Dr. Holliday has dedicated himself to education, having spent much of his career as a middle school and high school administrator in Ohio and Georgia and then as a faculty member at Kennesaw State University. He has also dedicated a great amount of time and effort to working with young people in helping them identify and articulate their values and life goals. His schools have long been characterized and recognized for exceeding academic expectations because of his willingness to take acceptable risk, his sensible and savvy leadership talents, and his success as a change agent. He earned his Ph.D. in educational leadership from Ohio State University, where he was selected by his professors as the top scholar in his class. He has presented many cutting-edge ideas at numerous state, regional, national and international conferences across the United States. He has served as a classroom teacher (rural) and as principal of both middle and high schools. He has been an assistant superintendent for school improvement for the Cobb (Georgia) County Public School District (suburban), as well as chief of staff for the Atlanta Public Schools (urban). Doc Holliday is considered a leader in developing innovative, data-driven programs for high-risk, under-performing schools with diverse populations. One of his most important contributions to public education is having produced over 50 educators who have gone on to become successful principals and university leaders across the United States. He believes that public schools must learn how to take advantage of uncharted opportunities and how to stretch the few resources that are within their control. He is also a sought-after lecturer and presenter because of his wealth of knowledge in the field of education. 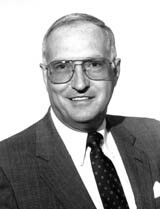 There are few alumni who are as notable or who gave back as much to Marietta College as Dr. Richard M. Krause ’47. Because of Krause’s distinguished career as well as his close involvement with Marietta College, he will be honored at the school’s 180th Founders Day ceremony on Thursday, Feb. 12. The program begins at 7 p.m. and also includes the acknowledgement of a handful of faculty awards. A major part of the tribute will come from one of Krause’s colleagues and a long-time friend, Dr. David Morens. A Senior Advisor to the Director at the National Institute of Allergy and Infectious Diseases, National Institutes of Health, Morens will give the keynote address. Dr. Mark Miller, Interim Vice President for Academic Affairs and Provost, said the College had planned on dedicating Founders Day to the life and legacy of Richard Krause even before his death. Morens’ career interest for more than 40 years has focused on emerging infectious diseases. He is past President of the American Epidemiological Society and in recent years he has published and spoken on numerous aspects of the history of infectious diseases and of epidemiology and public health. Morens will present a talk on the threat of emerging infectious diseases both historically and in the modern era. He will discuss specifically the many challenges of several infectious diseases and explain the measures being taken to control and prevent them by organizations such as the NIH. Because Krause spent so much of his career addressing emerging infectious diseases, in multiple fields including public health and epidemiology, Morens’ talk will include acknowledgments of what Krause did and thought, who he influenced, and his impact on the field. Krause died Tuesday, Jan. 6, 2015, after a short illness near Washington, D.C. Due to his unexpected passing, this year’s Founders Day will strive to commemorate the life and legacy that Krause is leaving behind. While at Marietta, Krause focused on mathematics, science, history and literature, including all the plays of Shakespeare. After Marietta, Krause graduated from medical school at Case Western Reserve in 1952. During medical school, he took 18 months off and worked with the late Dr. Charles H. Rammelkamp of Case Western on the prevention of rheumatic fever by early treatment of streptococcal sore throat with penicillin. Also, for a period of about four months during World War II, he worked in a venereal disease control program as a medic in the U.S. Army. From 1975 to 1984, Dr. Krause was the director of the National Institute of Allergy and Infectious Diseases (NIAID), where he developed new research initiatives in microbiology and immunology. Responding to the emergence of the AIDS epidemic, he organized field studies in Haiti and Zaire in a search for the origins of the virus. Krause’s work was seemingly endless — from Congressional testimonies to justify increases in the NIAID budget, to promoting public awareness concerning AIDS and HIV. In 1989, Dr. Krause returned to the National Institute of Health as senior scientific advisor in the Fogarty International Center, where he was actively involved in international health issues such as AIDS and emerging infectious diseases. Krause never forgot his hometown or his alma mater. He donated a good portion of his art collection to Marietta College, which has benefitted the Art Department. He also honored his parents by establishing the Ellis L. and Jennie Mae Krause Memorial Scholarship Fund and later the Ellis L. and Jennie Mae Krause Lecture in Science. To read more about Dr. David Morens' visit click here. Two decades after surviving the genocide in the East African country of Rwanda, Ilibagaza will journey to Marietta College to be the 2014 Founders Day keynote speaker. Founders Day will be observed on Feb. 13, though the actual anniversary date of the College’s charter is Feb. 14. Ilibagiza has a unique perspective to bring to Marietta, as her experiences have been nothing less than inspiring. While her country was destroyed and her family was killed during her time in refuge, Ilibagiza overcame her fear and resentment through intense prayer, as inspired by her religious father. When she was finally able to resume a normal lifestyle, Ilibagiza began work for the United Nations in 1998. In 2006, she wrote her first book, “Left to Tell; Discovering God Amidst the Rwandan Holocaust,” which became a New York Times best seller. According to the Washington Speakers Bureau, she has honorary doctoral degrees from the University of Notre Dame, Saint John’s University and Walsh University. Additionally, she has received numerous humanitarian awards including the Mahatma Gandhi International Award for Reconciliation and Peace in 2007 and the American Legacy's Women of Strength & Courage Award. A finalist for Belifnet.com’s “Most Inspiring People of the Year 2006,” Ilibagiza has been featured in several documentaries and her life story will be turned into a major motion picture in the near future. Miller says Ilibagiza is the perfect speaker to coincide with Marietta College’s theme of global issues. He became interested in her story after seeing it on a “60 Minutes” documentary. “I was amazed by it,” he says. Dr. Miller hopes the students who listen to Ilibagiza are able to realize the massacres that occur halfway around the world do matter, even to those of us in the Mid-Ohio Valley. 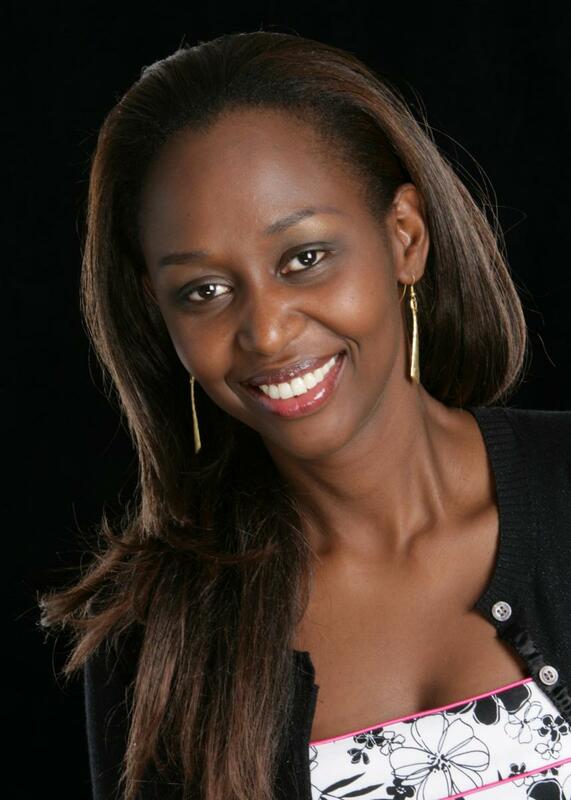 To read more about Immaculee Ilibagiza's visit click here. Eugene Robinson, who is considered one of the nation's most remarkable storytellers and is the winner of a Pulitzer Prize for commentary on the 2008 presidential election, will deliver the keynote address at Marietta College's 178th Founders Day ceremony. Robinson will highlight an evening that also includes handing out special honors and awards to Marietta faculty at 7 p.m., Thursday, Feb. 21, in the Alma McDonough Auditorium. It is free and open to the public. "Mr. Robinson established a strong record as a journalist and columnist for The Washington Post, always probing challenging issues in American political life," said Dr. Gama Perruci, interim Provost and Dean of the Faculty. "We are very fortunate to have him as a our speaker. He will bring a depth of experience dealing with political leadership in Washington. Given our focus on leadership and social justice, he will be perfect as a speaker in this area." A newspaper columnist and television political commentator, Robinson is known for having the ear of the insiders of the nation's capital. He is the author of "Disintegration: The Splintering of Black America," and he provides political commentary on television news programs such as MSNBC's "Hardball," "The Rachel Maddow Show" and NBC's "Meet the Press." Robinson has spent more than 30 years with The Washington Post, where he writes a twice-weekly column. 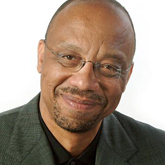 In 2009, he received the Pulitzer Prize for Commentary for "his eloquent columns on the 2008 presidential campaign that focus on the election of the first African-American president, showcasing graceful writing and grasp of the larger historic picture." 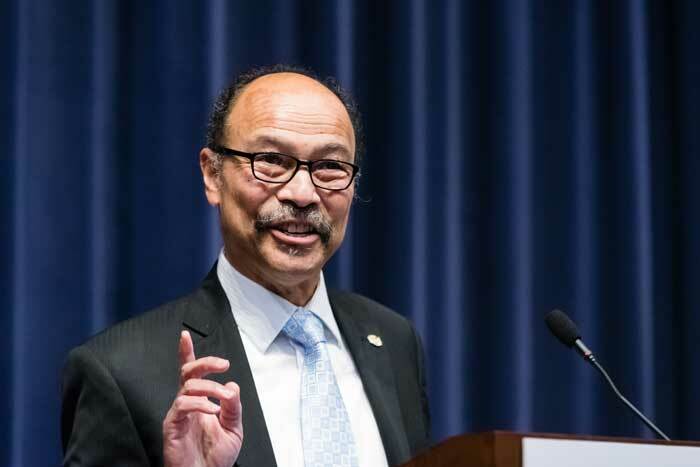 To read more about Eugene Robinson's visit click here. Paul J. Zecchi founded Central Resources, Inc., in 1988 and remains the majority shareholder. Zecchi has presided over all corporate functions since inception and has been the lead in Central's acquisition and divestiture efforts. He instituted the Company's international diversification plan in 1997. Prior to this time, Zecchi held various executive, management and engineering positions with Schlumberger Technology Corporation and Tenneco Inc. (natural gas divisions). He is the former president of the Independent Petroleum Association of Mountain States and is a member, or former member in many other industry organizations. Currently, he is a director and/or officer of several corporate and charitable boards. Zecchi graduated from Marietta College in 1970 with a Bachelor of Science in Petroleum Engineering and from Rensselaer Polytechnic Institute in New York in 1979 with a Master of Science in Management Science. Zecchi's appearance is also in conjunction with the College's Annual Common Theme, which is Energy & Environment during the 2011-12 academic year. Marilyn Moon, a member of Marietta College's Board of Trustees, is Vice President and Director of the Health Program at the American Institutes for Research. A nationally-known expert on Medicare, she has also served as a Senior Fellow at the Urban Institute and as a public trustee for the Social Security and Medicare trust funds. Dr. Moon continues to write extensively on health policy, both for the elderly and the population in general, and on social insurance issues. Her most recent book, Medicare: A Policy Primer, was published by the Urban Institute Press in 2006. From 1993 to 2000, Moon also wrote a periodic column for the Washington Post on health reform and health coverage issues. She has served on a number of boards for non-profit organizations including the Medicare Rights Center and the National Academy of Social Insurance. Dr. Moon is currently chair of the Maryland Health Care Commission. She is a member of the Institute of Medicine of the National Academy of Sciences. Dr. Moon earned a Ph.D. in economics from the University of Wisconsin-Madison where her work focused on the health and economic status of the elderly. Previously, she has been an associate professor of economics at the University of Wisconsin-Milwaukee, a senior analyst at the Congressional Budget Office, and the founding Director of the Public Policy Institute of the American Association of Retired Persons. Featured Speaker: Dr. Ronald C. White Jr. Presentation: "Abraham Lincoln 2010: Wisdom for Today"
Dr. Ronald C. White, Jr., is the author of A. Lincoln: A Biography, published by Random House in January, 2009. This presidential biography is a New York Times, Washington Post, and Los Angeles Times Bestseller. A. Lincoln was the main selection of The History Book Club for January 2009. White is also the author of Lincoln's Greatest Speech: The Second Inaugural (2002), honored as a New York Times Notable Book of 2002, and a Washington Post and the San Francisco Chronicle bestseller, and The Eloquent President: A Portrait of Lincoln Through His Words (2005), a Los Angeles Times bestseller and a selection of the History Book Club and the Book-of-the-Month Club, which said, "this is a book unlike any other you have read on our 16th president." He has lectured at the White House as well as hundreds of universities, civic organizations and conventions. He has been interviewed on the News Hour with Jim Lehrer. Dr. White is a graduate of UCLA, Princeton Theological Seminary, and earned his Ph.D. in Religion and History from Princeton University. He has taught at UCLA, Princeton Theological Seminary, Whitworth University, Colorado College, and San Francisco Theological Seminary, where he served as Dean and Professor of American Religious History. 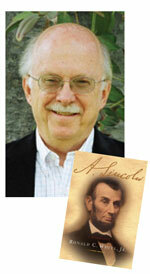 He is presently a Fellow at the Huntington Library and a Visiting Professor of History at UCLA. He lives with his wife, Cynthia, in La Cañada, California. 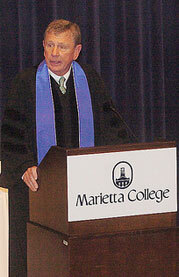 Kurt Stocker delivered the Founders Day Address, "Trust in an Uncertain World." He is is currently a ember of the board of the New York Stock Exchange Regulation, overseeing the working of the Exchange and its members, and a member of the Board of Governors of the Financial Industry Regulation Authority, that under the egis of the SEC regulates all brokerages. The former Chief Corporate Relations Officer for Continental Bank Corp., he was part of the team that took over the bank in the years following its failure and bailout by the FDIC. Stocker focused on how and where we can find information and organizations that engender trust in this new and uncertain world. 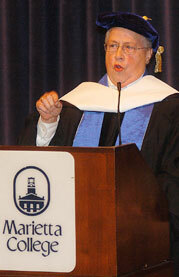 Georgia E. Lesh-Laurie '60, one of the nation's preeminent voices in higher education, has agreed to address Marietta College's students, faculty and staff during the 173rd Founders Day Convocation on Feb. 14 in the Alma McDonough Auditorium. She is the Chancellor Emerita of the University of Colorado at Denver and former chief academic officer of the United Arab Emirates University. She served as Chancellor for eight years and previously served as Vice Chancellor for Academic and Student Affairs on the Denver campus. The title of her speech was "Go Global." 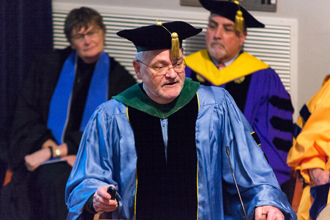 Douglas Gomery, delivered the Founders Day Address, "What do professors really do." He is currently senior researcher at the Library of American Broadcasting (LAB) at the University of Maryland. One of the five largest broadcasting libraries in the world, the LAB deals with both commercial broadcasting and public TV/radio. His 20 books—and more than 1,000 articles from all sort of encyclopedia to every related mass media journal to Modern Maturity (which his late mother took the most pride from)—have been translated into eight languages. He was the U.S. Postal Service consultant on “The 1980s” series for the stamp commemorating “Cable TV,” issued in Spring 2000. 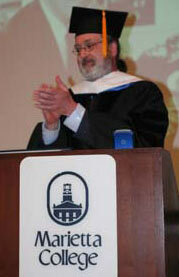 Bruce Payne, delivered the Founders Day Address, "Leadership, Ethics, and Drama." Long involved in leadership studies, theatre, and political science, Dr. Payne is currently the director of "Leadership and the Arts: A Duke Semester in New York City," which offers students planning careers in law, business, government and teaching an opportunity for an experience of deep immersion in the arts. A lecturer in the Terry Sanford Institute of Public Policy at Duke University since 1973, Payne has connections with MC that reach back to August 1987, when he welcomed the first class of McDonough scholars to the campus. At that time, he was awarded an honorary doctorate from Marietta College in recognition of his sustained contribution to the study and practice of leadership. The 2005 Founders Day speaker was former Board of Trustee member Tim Cooper, who graduated in 1973. Cooper retired as Partner In-Charge of the Audit and Business Advisory Practice at the Columbus office of Arthur Andersen LLP in August 2000. He is the president of Smoky Mountain Trains LLC in Bryson City, N.C. He was an active trustee at MC from 1994 to 2004 and the Annual Fund Chair from 1996-99. 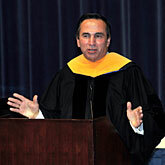 He was given the Distinguished Alumnus Award in 1986 and the MCAA Service Award in 2002.